Softwear.com is a cappuccino of a musical—full of the deep caffeinated energy of the dotcom era, supported by an ample portion of the steamed milk of nineteen original songs, and topped with a generous froth of I-lived-through-that humor. Set in the late 1990s, Softwear.com is the story of two inexperienced but high-energy guys in a garage with a great idea for a fashion web site who get ninety million dollars in funding from an opportunistic venture capitalist and rapidly ride the dotcom boom to paper multi-millionaire status then just as quickly crash to the ranks of the unemployed. Like the now-mythic heyday of Silicon Alley the show includes politically correct true love, outrageous employee perks, Taj Mahal office spaces, on-line fashion shows, and extravagant launch parties. But the high living doesn’t last long when there’s no money coming in. Coping with everything going wrong leads to growing maturity, love victorious, and a triumphant happy ending. 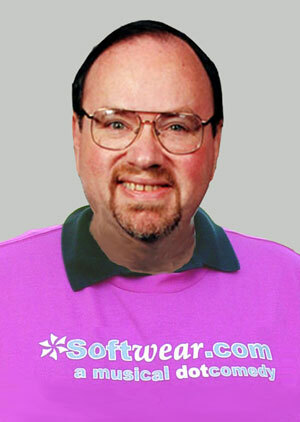 Softwear.com the Musical got its start when the tune and opening lines for the show's theme song, A Great Idea, first popped into Dave Schroeder's head in early 2002. Over the next few months the general shape of the show took form and thanks to a fortuitious break between jobs and tremendous support from his family Dave was able to write the book and 19 original songs for the show that summer. The musical draws on Dave Schroeder's experiences on the front lines of the dotcom revolution in senior technical roles at IBM's Interactive Media division, a major Internet consulting company, and a major dotcom. It also owes quite a bit to the absurdity of Gilbert & Sullivan's operettas, which seem rather similar in that regard to the excesses of the dotcom era. Please click on the link to the one-page summary of the plot to learn more. We hope you'll be able to make the show in New York on April 15-18, 2004. Our world Off-Off-Broadway Premier was a major success with full theatres on Friday and Saturday evenings and large audiences enjoying the show for the matinees on Saturday and Sunday. We captured the Sunday afternoon show on video and recorded all the songs for the cast album immediately afterwards. In four to six weeks we should have both CDs and DVDs of the show to share. Many thanks to everyone who came to the show and supported our talented cast and crew. Softwear.com A Musical DotComedy T-shirts are now available by mail for $10 each plus $3 postage and handling. The shirts are 100% cotton in hot pink and are available in S, M, L, XL, XXL, and XXXL sizes. The two largest sizes are $2 more each. Please allow 10 days for shipping. We will email you a confirmation when your shirt(s) are sent. For more details about Softwear.com the Musical and to receive occaisional mailings related to the show, please send email to dschroeder @ mindspring.com with Softwear Mailing List in the Subject line and you'll be added to our mailing list to find out if we've been accepted by the 2003 NYC Fringe Festival in April of 2004, learn when CDs and DVDs of the show are available, and more.